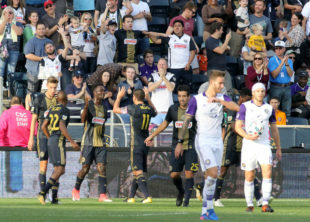 A second half Alejandro Bedoya goal ended the second of those streaks, but a maturing though ultimately incomplete Union couldn’t end the first. They’ll get another crack at their second win this Friday night against The Lions of Orlando City. For fans of goals, comebacks, and 90 minute swings of emotion, look no farther than this Orlando side. A 4-3 win over the visiting Red Bulls followed by a 3-2 come-from-behind thriller over Portland Timbers has the Lions looking like this year’s cardiac cats. They’re a week ahead of the Union in matches played, but just like the Union, they played four of five matches to start the season off at home. A draw against D.C. and a loss to Minnesota round that slate out, with a road loss at Yankee Stadium sandwiched in the middle. Head coach Jason Kreis, he of Real Salt Lake fame and New York City FC shame, has rebuilt Orlando this year. With Cyle Larin off on his Turkish adventure, Dom Dwyer leads the attack with Will Johnson, Justin Meram, and Sacha Kljestan as the big names behind him. They’ve had success in both a 4-2-3-1 and a 4-4-2 formation, so the Union will have to be prepared for either. Given the team’s struggles against Colorado’s two-forward set and Kreis’s diamond midfield when he was in Salt Lake, perhaps Orlando will opt for the latter. Either way, don’t expect the visitors to be passive against the inconsistent Union. These two will likely be fighting for the last playoff spot come September and three points in April matter as much as those available in the late summer and fall. The Union played some of their most creative and assertive soccer of all time last week against San Jose. They passed out of the back (hello, Andre Blake’s 82% success rate), pinged the ball in tight spaces, and generally looked like they had a plan for two thirds of the field. Their chemistry in the final third remained lacking, however, and the team left the pitch to a chorus of boos after settling for a 1-1 draw. So Union? For now. With lessons learned and another game under the belts of the team’s young back line, the Boys in Blue will look to improve on their mediocre (though better than 2017) start to the season. Expect the team’s standard 4-2-3-1 with no changes from last week, though perhaps Corey Burke or Jay Simpson ought to get a look up top as a change of pace. That’s an unlikely outcome however, as repeat lineups and unchanged formations are themes of Jim Curtin’s tenure. They probably won’t be marking one another, but this battle of number 10s will determine the outcome of Friday’s match. Kljestan is a known quantity in the American soccer landscape: a legit league player with borderline national team pedigree, someone who’s played the game at a high level here and in Europe. He’s starting another chapter in MLS this season with Orlando and only beginning to gel with his new teammates, but he knows the Union well enough to hurt them. Dockal is getting to know his teammates too, but also getting the feel for the pace and quirks of the league. In his first two matches he looked out of sorts. Then he finally had a game to match his quality against San Jose, and will be ruing not putting his name on the score sheet. Expect him to become even more accustomed to his team and the league on Friday, and expect the winner of this match up to take the points as well. The only expected 2018 starter missing from the Union’s line up against San Jose was Fabinho, out again as he continues to recover from a meniscus injury. It will take a few more weeks to see him again on the left side of defense, and Matt Real is earning his stripes in Fabi’s stead. His performances have been encouraging, if incomplete, which is expected from a young player. This week he’ll have the task of bottling up MLS veteran Justin Meram or pint-sized play-maker Josue Coleman, and neither is an easy task. If Real keeps playing within his obvious skill set and the Union keep their shape, success will follow for both. The Union could have scored 10 against what has become a surprisingly competent New England side to open the season. They might have had 5 against San Jose last week had the ball bounced their way or the rust been shaken off of Fafa Picault before the match. If they build on their performance from Saturday, they should be due for a few goals and a clean sheet. Since it happens to be this ever-optimistic author’s birthday today, he’s giving the team a big win in celebration. Hey Chris, FYI, while it would be awesome if the Union had 45 points already, they only have 5. And a MLS Cup with a shot at winning Champions League. Thank you for catching that. I’ll update it! We’ve had a pretty good home record over the last year, hopefully we can build on that. Meram, Dwyer & Kljesten are going to be a handful. Keegs is going to earn his money this week trying to contain Meram. Trusty/Elliot are getting a real test against a physical forward in Dwyer. Hopefully Medunjanin/Ale combo keeps Kljestan from getting space enough to pull the strings. As for offense… Well I hope the offense shows up on Friday. We can beat Orlando, but I don’t think we keep them off the scoreboard – which means we have to score!! Let’s see it boys! For whatever it’s worth, in Union history in the match closest to April 12th, the team have 5 wins, 2 draws, and only 1 loss. They play hard for me. Happy B day Chris. Personally , I’m a little worried about the middle of the pitch. I might not have a chance shutting down Kljestan since Bedoya and medujanin aren’t true D mids. I’d like to see D Jones implemented if need be. Sub him in for Bedoya. He’s a good disrupter in the middle, great at distributing in the counter and can get forward. I don’t understand why he isn’t used more. They say they want to “let the kids “ play. Well, continue that fad then. Derrick hasn’t even been on the game day 18 I believe the last couple games. Feel free to correct if I am incorrect. I believe you’re right. I’d dont know why he hasn’t been in the 18. I truly do wish Derrick Jones were great at distributing on the counter attack. Whether with the Union or at the Steel, he tends to look for others to do that job, e.g., Medunjanin, Bedoya, Chambers, Najem. Orlando now will be missing two starters from an already leaky backline. Perfect opportunity for the U to get the offense clicking.